The town of Chateaudun. 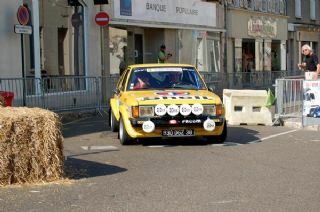 just south of Chatres in France, witnessed the largest gathering of works Talbot Sunbeam Lotus rally cars on the 20/21 July. French collector Michel Civade held a Sunbeam Lotus Revival event that included a static show on Saturday, gala dinner in the evening and demonstration run through the closed streets on the Sunday. From the UK, ex-team drivers and co-drivers Russell Brookes, Robin Eyre-Maunsell, and Neil Wilson made the trip, together with Sunbeam Lotus chief development engineer Wynne Mitchell. Bringing the latest addition to M. Civade’s collection, KDU 111V, Jim Little from Carlisle was another honoured guest. Having worked with the Talbot Team during the World Championship years, he is now a specialist in rally preparation and restoration of the model, and responsible for the impressive appearance of many of the cars shown. Unfortunately, there were last minute apologies from Stig Blomqvist and Guy Frequelin, although Jean Luc Therrier did attend and Jean Todt, co-driver to Frequelin in 1981, had prepared a video message. Former Talbot Team member Christian Bailly also attended, and was responsible for much of the event’s organisation. All the remaining works cars from the UK made the trip; KKV 444V, PVC 999W and YHP 333X, together with several dedicated Sunbeam Lotus enthusiasts and owners.